Our Kangaroos 2016 Replica Professional Jersey. Featuring Canterbury’s contemporary Rugby loop 21.1 neckline, this jersey is breathable and lightweight, and made from 100% polyester sublimate jersey. This makes it ideal for when you’re out training or watching your favourite team play. 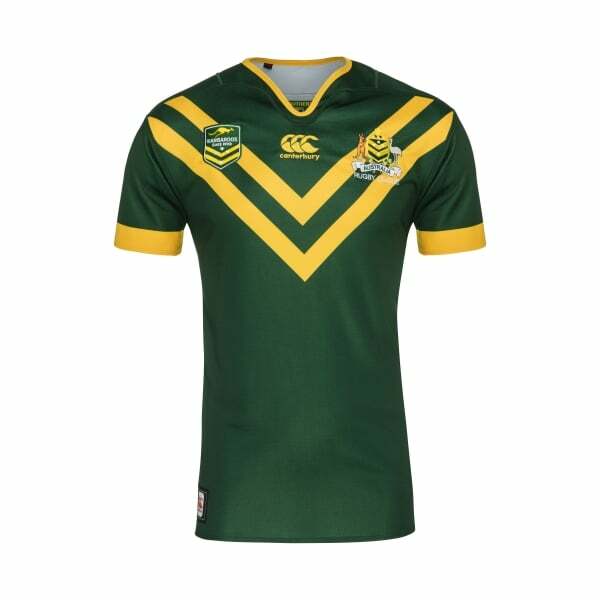 Display your national pride by wearing your very own Kangaroos 2016 Replica Professional Jersey. Featuring Canterbury’s contemporary Rugby loop 21.1 neckline, this jersey is breathable and lightweight, and made from 100% polyester sublimate jersey. This makes it ideal for when you’re out training or watching your favourite team play. With its Kangaroos and Coat of Arms chest logos and signature Kangaroos V, no one will doubt your allegiance to our Australian national rugby league team. In true Canterbury tradition, our replica jersey’s have all of the same features as the jerseys we supply to Australia’s best sporting men and women. For unsurpassed quality, durability and comfort, our 2016 Kangaroos replica jersey is an exceptional choice for all fans.